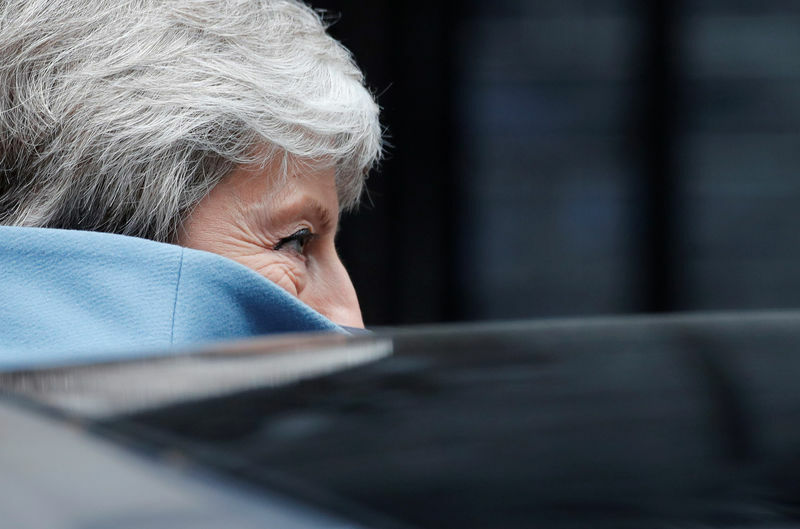 LONDON (Reuters) – British Prime Minister Theresa May is expected on Wednesday to indicate a date for quitting as the price for getting her twice-defeated Brexit deal ratified, while parliament tries to select its own alternative from a multiple-choice list of options. With British politics at fever pitch, lawmakers on Wednesday grab control to have so-called indicative votes on Brexit, with 16 options ranging from a much closer post-exit alignment with the EU to leaving without a deal or revoking the divorce papers. Just two days before the United Kingdom had been originally due to leave the EU on March 29, some of the most influential Brexit-supporting rebels, such as Jacob Rees-Mogg, have reluctantly fallen in behind May’s deal. The price for May may be her job. She is expected to indicate a date for her departure at a showdown with Conservative Party lawmakers at a meeting of the 1922 Committee in Westminster at around 1700 GMT. Before that, lawmakers start a debate on what sort of EU divorce the world’s fifth largest economy should go for. They will vote at 1900 GMT on a ballot paper for as many proposals as they wish. Results will be announced after 2100 GMT. The head of the European Council Donald Tusk urged the European Parliament to be open to a long Brexit extension and not to ignore the British people who wanted to remain in the EU. “You cannot betray the six million people who signed the petition to revoke Article 50, the one million people who marched for a People’s Vote, or the increasing majority of people who want to remain in the European Union,” said Tusk, who chairs summits of EU leaders. Britons voted 52-48 percent to leave the EU in the 2016 referendum. Voters appeared to be changing their minds about leaving the EU, polling expert John Curtice said on Tuesday, but not to a degree that would make a different result in another referendum a safe bet. It is unclear if parliament’s attempt to find an alternative will produce a majority. House of Commons Speaker John Bercow will select which of the proposals will be put to a vote. Among the 16 options that could be voted on are a public vote on a deal, an enhanced Norway-style deal and Labour’s plan for a customs union and close alignment with the Single Market. To succeed, May needs at least 75 lawmakers to come over – dozens of rebels in her Conservative Party, some opposition Labour Party lawmakers and the Northern Irish Democratic Unionist Party (DUP), which props up her minority government. The Sun newspaper said Graham Brady, chairman of the 1922 Committee, told May the party’s lawmakers want her to set out a timetable to quit before the summer. As Brexit supporters came behind her deal, it was unclear how the DUP would vote. “I am now willing to support it if the Democratic Unionist Party does,” Rees-Mogg wrote in the Daily Mail. Boris Johnson, who led the Brexit campaign, indicated he could come behind the deal if May gave an exit date. If May does not get the deal approved this week, London will have until April 12 to offer a new plan or decide to leave without a treaty. If she can get it approved this week, a departure date of May 22 will apply. European Commission President Jean-Claude Juncker said it was unclear how Brexit would unfold. “If you compare Great Britain to a sphinx then the sphinx would seem to me an open book. We will see in the course of this week how this book will speak,” he said.